In our April issue, reader Mike Dodman appealed for villagers to share their memories of a 1960s band called The Cellarmen – and as soon as the magazine was published, people started getting in touch. As well as hearing from several fans who remembered following the band around the Village area, we were also contacted by two former Cellarmen. Between them all, they have provided a comprehensive history of the group – and even a couple of photos, which also illustrate The Cellarmen’s entry in Brum Rocked On, Laurie Hornsby’s history of the “Brumbeat” groups. 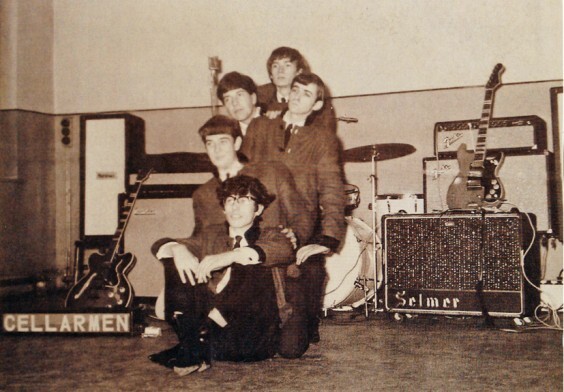 The Cellarmen were formed in 1962–3 by a group of mates from Bromsgrove County High School. The original line-up consisted of brothers John and Peter Hadley (lead guitar and bass), Kevin Fryer on rhythm guitar and Dave Simpson on drums, all of whom were resident in Barnt Green. Lead vocalist was Stuart Gorman of Rubery, while another Barnt Greener, Peter Quine, was the band’s manager. In those days the lads rehearsed in a Barnt Green loft above a garage belonging to the local butcher, Mr Wiggins – his daughter Liz was another school pal. They had their first gigs at Barnt Green youth club, Hopwood caravan park and the fondly-remembered Greenfields nightclub at Withybed Green, Alvechurch. “The club was built on pillars, as it was a natural water plain, and it would truly be rocking on Monday evenings,” says reader Meg Brain. “The band didn’t even have a name in those early days,” recalls Kevin. However, the link with Alvechurch prompted a move to a new rehearsal venue – The Cottage on Redditch Road, then the home of their friend Steve Naylor and now Sandhills Nursery – whose large cellar gave the group their name. Peter’s father recalls that he and his wife had to drive the lads to their gigs as they were too young, and also remembers buying them a microphone. As The Cellarmen began to play at bigger venues such as church halls, there were several personnel changes: Stuart left for university, and the Hadley boys and Peter Quine also quit. 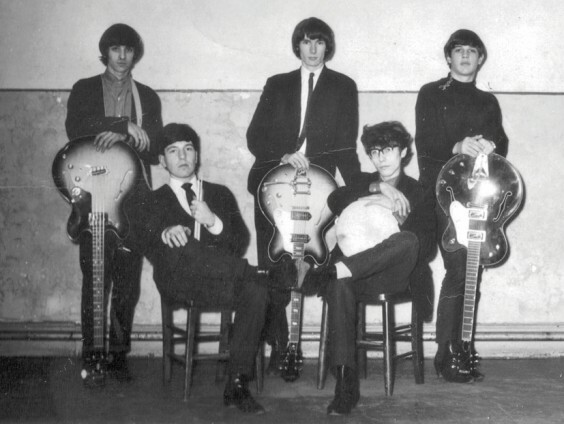 Another former Bromsgrove County student and Blackwell resident, Phil Hobbis, joined as lead singer in February 1964, followed by Johnny Collins, of Bromsgrove, on bass and Dave Joynes, of Marlbrook, on lead guitar. Dave’s father became the band’s new manager, which is why the business card discovered by Mike Dodman (pictured right) bears the address of the Joynes family home. “The Cellarmen were busy – I’ve counted 73 gigs in 1964, 152 in 1965 and 135 in 1966,” says Phil, who still has his diaries from the period. The band also played at venues including Marlbrook, Bromsgrove and Cadbury’s Youth Clubs, The Marlbrook Hotel, Edgewood Hall in Rednal, Garringtons, The Chalet at Rednal, The Chateau Impney, The Tardebigge, Worcester Co-op Hall, Droitwich Winter Gardens, Stourbridge and Kidderminster Town Halls, the Plaza at Old Hill, and the Ritz at Kings Heath. The band even played support for Cream at Malvern Winter Gardens, as well as the Yardbirds, the Kinks, and Gene Vincent. Kevin tells us that they entered a music contest at the Hen & Chickens, but lost to The Applejacks! Kevin decided to leave the group in January 1965 and was replaced by Adrian Halfpenny, known to all as “Butch”, who lived in Marlbrook. When Dave Simpson also quit the band, his replacement was Clive Thompson, who lived in Alvechurch and had previously been a member of The Memphis Sounds. His brother ran the Rainbow Suite in Birmingham. Clive’s father, Albert Thompson, became manager for a time, but Clive himself was later replaced by Brian Seed, who had previously drummed with another Bromsgrove group, The Pack, alongside Adrian. Phil also recalls The Cellarmen rehearsing with Peter White, who had played with Birmingham group The Rotundas and went on to become the UK’s top Kenny Rogers tribute act! Johnny Collins married Christine Nicholls (the sister of Paul Nicholls of The Pack) in September 1966, and his new status led to him leaving the group early in 1967. Roy Watts, who had previously played with another Bromsgrove group, The Bent Society, replaced Johnny on bass guitar. “Somewhere between August ‘66 and February ‘67, we had a name change and became The Moderation, but I can’t remember exactly how long that incarnation lasted,” says Phil. The following year he joined up with ex-members of Worcester group The Suedes; after a name change to The Rubber Duck they became full-time professionals and went off to tour Europe, armed with contacts made during lead guitarist Joe Dunnett’s time with Birmingham group The Renegades. Phil had a long career fronting many bands and spent 14 years living in Norway and raising a family with his Norwegian wife. It is not long since he retired after a final stint of about 20 years as a solo entertainer. Sadly, Johnny Collins passed away last year, and Clive Thompson some years ago. However, other members of The Cellarmen’s various line-ups are still in touch – and The Village has even been able to help some of them to reconnect! Thank you to everyone who contacted us – but there is still one mystery remaining. . . just who is the young man in the photo found clipped to The Cellarmen’s business card (right)? Reader Terry Pritchard thinks it could be original member John Hadley, but neither Kevin nor Phil recognise it as being him. We’d still like to hear from you if you can shed any further light, or have any other memories of The Cellarmen – and don’t forget that if you have any historic photos or memorabilia from local events, we’d love to see them! Top: The Cellarmen in 1964: (from top) Dave Joynes, Dave Simpson, Johnny Collins, Kevin Fryer and Phil Hobbis. Below: The Cellarmen in 1965: Johnny Collins, Dave Simpson, Dave Joynes, Phil Hobbis and Adrian Halfpenny.